You need to have the right licenses installed to access Prolaborate without any issues. The purpose of this article is to show you how you can add or update Prolaborate-license. Please note only Admins can manage licenses. After installing Prolaborate, when you are logging in for the first time, you will see the following screen. Please share the Machine ID with Prolaborate team. As per the contract, you will be given an Activation key. Login and click on Activate Offline and upload the key. The license status will change and your license information will be displayed on the screen. You can verify the information like License users, No of Shares, Iframe Support, etc. If you want to look at this information again, click on Menu > License. 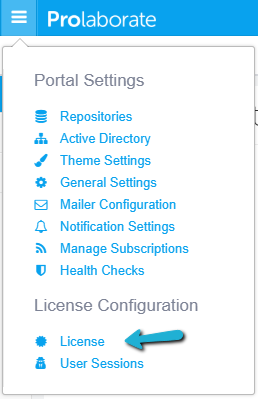 Click on Menu > License to go to the License page. Remove the expired key by clicking on Remove Product Key.Click on Choose File, choose the Activation key and then click on Activate Offline. The new license details will be visible on the screen now. This page shows the number of users who are logged into Prolaborate at a particular time. Click on Menu > User Sessions to go to this page. You can Delete Idle Sessions which are consuming the licenses to give full access to other users. You can also set the Idle Session timeout time. Idle users will automatically be signed out after this time.